May 12 -The focus on World War III, as it has been for the past nine or ten weeks, begins and ends with Ukraine. All other hotspots in the world were relatively quiet. 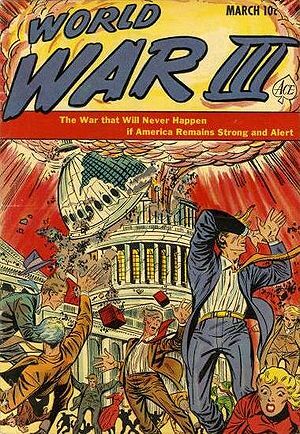 “World War 3” is a term which is now regularly used by the U.S. Corporate Media. The Corporate Media continue to rely on a now-regular and heavy use of the terms “World War 3” and “World War III” when referring to the Ukrainian crisis. China and Japan settled back into an uneasy quiet. One interesting happening in Asia: days ago, the USA and Philippines concluded a 10-year agreement for basing US troops in the East Asian country. This puts US troops and missiles back into China’s sphere–but it also exposes those troops to increased danger when the shooting begins. This past week the Philippines seized a Chinese fishing boat and has jailed the Chinese fishermen. The major players continued to move their troops around and in Ukraine, but the major troop movements seem to have been made. SPECULATION: The Corporate Media pattern over the last 10 years–especially in the last 24 months– to increase reporting and ramp up tensions in a particular area for a few weeks continues. Tensions have remained uncharacteristically high in Ukraine for the past 9-10 weeks. The high-stakes game of chicken in the former Soviet republic of Ukraine between the USA, Ukraine, Russia and NATO continues–but the chaos seems to be leveling off in that former Soviet state. Tensions remain high in Ukraine, especially eastern Ukraine but have leveled off the past week despite media efforts to keep the story in front of the world’s attention-challenged masses. 40% chance of World War III is DOWN 2%. Continuing clashes between pro-Russian and pro-Western Ukrainian groups in eastern Ukraine have maintained a steady level of chaos. A continued chance of a domestic terror attack [+55%] leading to war in the Middle East. Asia is warming up once more. Japan-China continues to simmer. Philippines seized Chinese fishing boat. US troops have deployed to Philippines for war games. China has accused USA of stoking the tensions. Russia – down slightly. Vladimir Putin seems committed to adding territory from former USSR republics to Russia. Putin has maintained that Russian troops have been pulled from Ukraine. USA – UP with troops to Ukraine for “exercises” and troops to Philippines for war games. May 12, 2014 – In the Ukraine, “chaos” is the new normal for the country which means that anarchy and chaos threaten neighboring countries such as Poland and the Baltic states (Estonia, Lithuania, Latvia). Tensions have remained steady in Ukraine over the past week. Arrival of US troops and some NATO forces for “exercises” keep pressure on Russia, which claims to have moved military forces out of country. Normal in North, South Korea; up very slightly in Asia; down slightly, Middle East; down slightly, elsewhere. Overall Tension Assessment: Ukraine seems to be settling in for a long period of “slow boiling.” One suspects only full capitulation of the Ukraine to Russia will ease the country’s level of chaos and disorder. When the capitulation occurs, Obama will get the blame for “another Munich.” The Munich Agreement handed over Czechoslovakia to the Nazis and was signed 11 months before World War II began–for all those who plan on using a future Ukrainian agreement as a timing mechanism for a future World War III. The USA and NATO will sit this one out and allow Russia to gobble up Ukraine–which will be very unpopular in the USA. This will be blamed on President Obama and will increase pressure for a strong leader in the 2016 U.S. elections. Asia is slightly elevated due to tensions involving Philippines and Vietnam and China. Syria, Israel, Iran, Egypt, Libya, Lebanon and the middle east in general haven’t gone away: these spots are all quiet for right now.